This year marks the tenth anniversary of Lake Tahoe’s Watercraft Inspection Program. 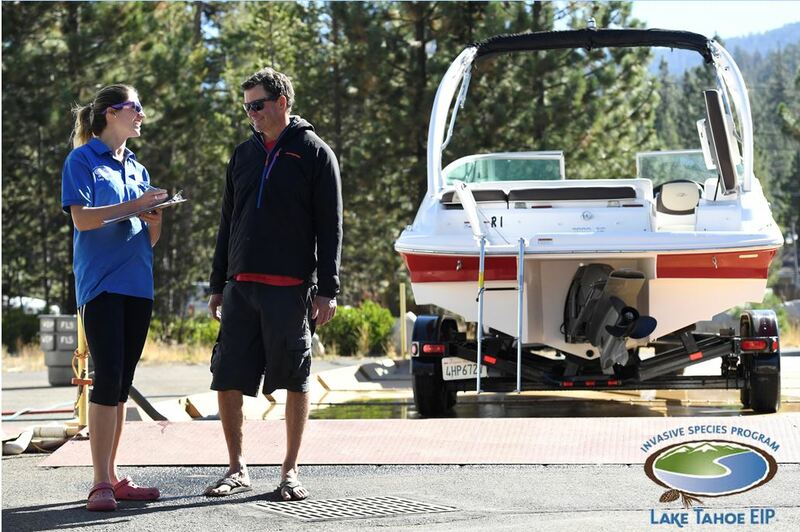 Under the program, every motorized watercraft is inspected to ensure it is clean, drained, and dry and not carrying aquatic invasive species before launching at Tahoe. Thanks to diligent boaters and watercraft inspectors, no new aquatic invasive species have been detected in Lake Tahoe since the program began 10 years ago. Of the nearly 8,000 vessels watercraft inspectors examined this boating season, 44 percent of them arrived clean, drained, and dry. Eleven watercraft were found carrying invasive mussels and 40 were harboring other species. 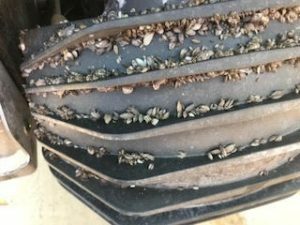 Adult quagga mussels were found attached to a personal watercraft at the Spooner roadside inspection station on July 18, 2018. This exemplifies the excellent work by the inspectors, but also that watercraft continue to be a vector of aquatic invasive species. Each fouled vessel was decontaminated prior to launching in Lake Tahoe. The largest number of decontaminations occur on vessels containing standing water, which may contain unwanted seeds, plant fragments, or microscopic larvae. 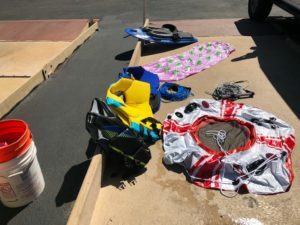 Boaters are encouraged to continue to be a part of the solution by cleaning, draining, and drying their vessel before launching in any waterbody. This includes both motorized and non-motorized watercraft. This July, Tahoe Resource Conservation District (Tahoe RCD) watercraft inspectors intercepted a pontoon boat harboring multiple aquatic invasive species of concern. An inconspicuous crack in the pontoon allowed water and vegetation to enter, and several invasive species then grew within. The boat came from Eastern United States and was inspected at the Alpine Meadows watercraft inspection station on Highway 89 in California. Staff discovered standing water, adult quagga and zebra mussels, aquatic vegetation, New Zealand mudsnails, and multiple other species inside the pontoon system. After discovery of the invasive species, inspectors coordinated with California Department of Fish and Wildlife and performed a full decontamination of the vessel to kill and remove all invasive species. On July 18, 2018, the adult quagga mussels were found on the reverse bucket of a personal watercraft. “They may hide on the hull, in your bilge, on your anchor, in your ballast system, or in this case: inside a pontoon. We’d like everyone to keep this in mind as they travel to other waterbodies or prepare for inspections.” All watercraft are required to be inspected prior to launching in Lake Tahoe. Quagga mussels were found on board a boat at the Meyers roadside inspection station on August 22, 2018. The decontamination process included a hot water wash (140 degrees Fahrenheit) of all toys, life jackets, anchors and lines. As fall approaches, boat inspections will move to select launch ramps and winter hours will begin on October 1. Tahoe Resource Conservation District (Tahoe RCD) inspectors will be stationed at Cave Rock and Lake Forest boat launch ramps from 6 a.m. to 4 p.m. seven days a week, weather permitting. All boats without an intact Tahoe inspection seal are required to get an inspection during daylight hours. Decontaminations are available at Cave Rock and Lake Forest throughout October as weather permits. Decontamination fees will apply for watercraft that are not clean, drained and dry. Watercraft that has been in a known infested waterbody will require a precautionary decontamination at no cost regardless of whether it has been cleaned, drained, and dry. Boats with intact inspection seals are permitted to launch at all open launch facilities; however, inspections are only available at Cave Rock and Lake Forest boat launch ramps. Boaters are encouraged to confirm hours and inspection locations at TahoeBoatInspections.com or by calling 888-824-6267. A display of sizes of quagga mussels to scale in inches. A new invasive species introduction in Lake Tahoe could have devastating impacts. Without natural predators, invasive species multiply quickly and can colonize the lake, as well as docks, water pipes, filtration systems, piers, ramps, and boats. They destroy fish habitat, impair boat engines, and negatively impact water quality and recreation, thus posing serious threats to the ecology, recreation, infrastructure, and economy of the Lake Tahoe Basin. To learn how to clean, drain, and dry your vessel and prepare for a watercraft inspection, please visit www.TahoeBoatInspections.com. Please note that the Truckee Watercraft Inspection Station is closed for the season. The other three stations will remain open through September 30, 2018. For non-motorized watercraft preparing to boat in the Lake Tahoe Region, please visit www.TahoeKeepers.org to learn more. The Fourth of July holiday and fireworks celebration brings a welcomed influx of boaters to the Lake Tahoe Basin. With sunny skies and warm temperatures predicted, boaters are urged to Clean, Drain, and Dry their boats before arriving at Lake Tahoe inspection stations to avoid delays and decontamination fees. As a reminder, all stations close at 5:30 p.m., so please plan accordingly. Every motorized boat is required to be inspected for aquatic invasive species prior to launching in Lake Tahoe. Since May, inspectors have intercepted and decontaminated four boats containing invasive quagga mussels bound for the waters of Lake Tahoe. Without natural predators, invasive species pose serious threats to the ecology, recreation, and local economies of the Lake Tahoe Basin. 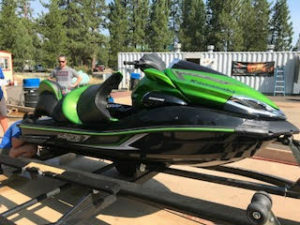 Watercraft are one of the primary transporters of aquatic invasive species, and the inspection program is critical to preventing their introduction into Lake Tahoe and surrounding waterbodies. A new invasive species infestation in Lake Tahoe could have devastating impacts. Invasive species multiply quickly and can colonize all underwater objects, including docks, water pipes, filtration systems, piers, ramps, and boats. They destroy fish habitat, impair boat engines, and negatively impact water quality and recreation. Visit TahoeBoatInspections.com or call 888-824-6267 for inspection locations, hours, fees, and information about boat inspections and invasive species. Weekdays and mornings are typically less congested at roadside boat inspection stations. Friday evenings, Saturdays, and holidays are typically the busiest. Prior to arriving, make sure your vessel is clean, drained, and dry. Returning Tahoe boats with a Lake Tahoe wire seal still affixed to the boat and trailer may head directly to a launch ramp to purchase a 2018 Tahoe Only inspection sticker. Check that all systems are working, batteries are charged, the boat has gas in the tank, and that you have the key to start the engine. Bring any specialized flushing adapters to the inspection station, as inspectors only have the most common types and sizes. If flushing your engine at home prior to inspection, make sure to drain all residual water. If inspectors find water on your boat they are required to decontaminate. Pull your drain plug. Nevada state law and local ordinance require bilge plugs be pulled while transporting a vessel on public roads. Annual watercraft inspection fees range from $35 for personal watercraft and vessels under 17 feet up to $121 for vessels over 39 feet. An additional fee of $35 is charged for any boat requiring decontamination, with an additional $10 fee for ballast systems. Fees are payable via Visa or MasterCard (no cash or check). Paddlers of kayaks, canoes and other non-motorized watercraft are encouraged to stop by an inspection station for a free inspection. Visit TahoeKeepers.org to learn how to self-inspect boats and gear and receive a free Tahoe Keepers sticker. 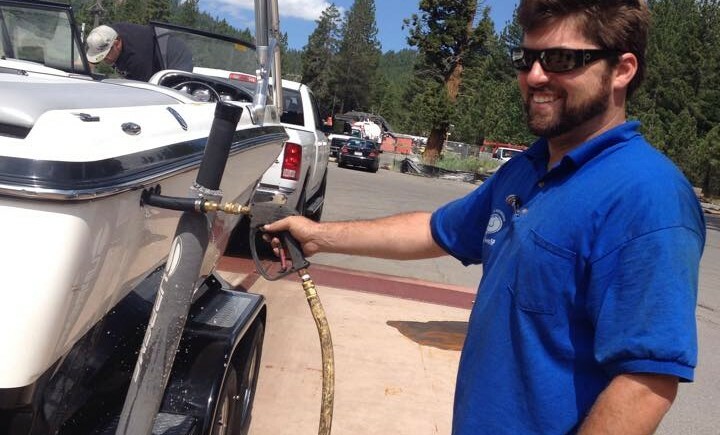 Take 3 Steps Closer to Fun by Arriving at Lake Tahoe Inspection Stations with your boat Clean, Drained, and Dry. The Watercraft Inspection Program is part of the Lake Tahoe Aquatic Invasive Species Program which is implemented by 40 public and private partner organizations including federal, state and local jurisdictions, research partners, public utility districts, and private marinas. The state, federal and local agencies comprising the Lake Tahoe Aquatic Invasive Species Coordinating Committee have provided leadership, direction and resources to fulfill this program’s mission of prevention, detection and control of aquatic invasive species in the Lake Tahoe Region. Learn more about the watercraft inspection program and AIS information by visiting TahoeBoatInspections.com or calling (888) 824-6267. So you think you know about AIS? 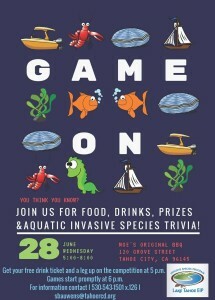 Join us Wednesday June 28th at Moe’s in Tahoe City from 5 p.m. – 8 p.m for trivia, fun, prizes, food, and drinks. Gain a leg up on the competition and a free drink ticket by joining us from 5 p.m. – 6 p.m.
Trivia will start promptly at 6 p.m. Starting in October boat inspections will move to select launch ramps and winter hours will begin. Tahoe Resource Conservation District (Tahoe RCD) inspectors will be stationed at Cave Rock and Lake Forest boat launches from 6 a.m. to 4 p.m. seven days a week, weather and construction permitting. All boats without an intact Tahoe inspection seal are required to get an inspection during daylight hours. Decontaminations are available at Cave Rock and Lake Forest throughout October as long as weather permits. Decontamination fees will apply for watercraft that are not clean, drained and dry. “Clean, Drain and Dry” watercraft that have been in a known infested waterbody will also require a precautionary decontamination at no cost. Boats with intact inspection seals are permitted to launch at all open launch facilities; however, inspections are only available at Cave Rock and Lake Forest. Boaters are encouraged to confirm hours and inspection locations online at TahoeBoatInspections.com or by calling the toll-free hotline at 888-824-6267. According to monitoring and scientific reports, Lake Tahoe remains free of new invasive species introductions, which are major threats to the overall health of Lake Tahoe and surrounding waterbodies. During the 2016 boating season, Tahoe RCD watercraft inspectors performed more than 7,500 inspections. In total, more than 15,000 vessels launched at Lake Tahoe, including both newly inspected vessels and those with intact Tahoe-issued inspection seals. As watercraft continue to arrive from high-risk waters, the importance of Lake Tahoe’s Watercraft Inspection Program remains critical. In fact, in 2016, 35 of the inspected watercraft were harboring aquatic invasive plants, mussels or snails. With our efficient roadside inspection stations, Tahoe RCD decontaminated approximately 3,500 watercraft with hot water, preventing invasive species from entering Tahoe’s waters. Tahoe RCD continues to support aquatic invasive species prevention efforts in the Truckee region. Tahoe RCD partnered with the Town of Truckee to provide watercraft inspections and decontaminations for Donner Lake at our Truckee-Tahoe watercraft inspection station. Please join the Town of Truckee at 6pm Wednesday September 28th at Town Hall in the Council Chambers for their second public workshop about the future of Donner Lake’s prevention program. Tahoe RCD watercraft inspectors also educated over 3,000 boaters and paddlers about preventing the introduction of aquatic invasive species at Prosser and Boca Reservoirs in Nevada County and Stampede Reservoir in Sierra County. Prevention efforts for over 12,000 paddlers in the Region occurred at beach kiosks, boat ramps and park entrances. Watercrafts were assessed for their risk of transporting aquatic invasive species from previously visited waterbodies. Paddlers were also educated about self-inspecting and decontaminating canoes, kayaks and paddleboards and encouraged to become a Tahoe Keeper (TahoeKeepers.org).